Robert Wood John Foundation teams up with Code for America to put people first, and strive to understand their needs and how to meet those needs in way that is sensitive, respectful and thoughtful of people’s health. This post was written by Paul Tarini and Pamela Russo at the Robert Wood Johnson Foundation. At the Robert Wood Johnson Foundation we believe everyone deserves the opportunity be healthy. To achieve that vision, we’re focusing on helping to build a robust Culture of Health in America so every one of us –rich or poor, urban or rural, good health or ill health—has the opportunity to live the healthiest life we can live. We’re working with others to transform systems so they focus on meeting the needs of people. And, because we know that health is influenced by more than just what happens in a hospital or a doctor’s office, we’re looking outside the traditional care system to try and improve the services and systems that influence people’s health, including social services such as housing or food assistance or education and transportation. Code for America’s vision for a citizen-centered government—one that responds to the needs of its people with services that are easy to access and simple to use—closely mirrors the transformation we at RWJF seek: to put people’s health at the center of the work. Because many of the services that influence our health are provided by government (more so if we’re low income or of Medicare age), we’ve teamed up with Code for America to bring fellows to New York City and Kansas City, Missouri to work with the municipalities on leveraging technology to improve how they provide health and social services. 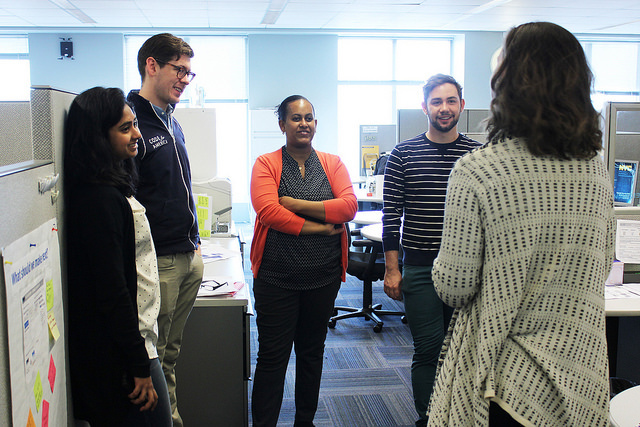 Code for America's New York fellows meet with city officials. In New York, fellows will be building a platform that helps case workers better determine what mix of social services and benefits would best serve clients living in poverty, while fellows in Kansas City will design a system that helps children get vaccinated on schedule, so they can start school on time. These fellows will take a year out from their regular jobs, allowing them to dedicate 100 percent of their work time to tackling these pain points identified by users of the system and coming up with tech-based solutions. We hope that their successes will spawn other efforts within New York and Kansas City to make services more citizen-centered. And we hope other cities pay attention, perhaps adapt the solutions developed, but at least look anew at the services they provide from the perspective of citizens. When we put people first, and strive to understand their needs and how to meet those needs in way that is sensitive, respectful and thoughtful of people’s health, we are laying the groundwork for a Culture of Health. We can’t wait to see how these fellow’s contributions help make the world where we live, learn, labor and play one that works for the health and dignity of the people.